If your living room has many furniture with edges, bring in something round too! Coffee tables are one of the few essentials that our living rooms have. 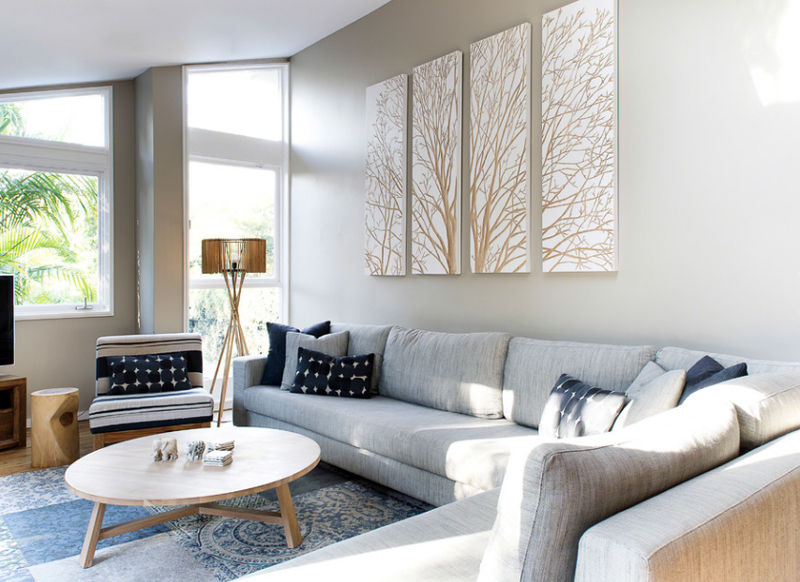 As much as having somewhere to place your magazines or coffee every time you’re in the living room is not really that important, people (home owners and designers alike) usually have this knack for adding a cute coffee table in the center of the living room. Most of the time, coffee tables do not come with the living room set when you actually purchase it, so picking for the one that would magically look great with your set is a blessing. Kidding aside, I think that this list is one great source of samples for us in picking the right piece of coffee table you can pair with your stunning living room set, take a peak! 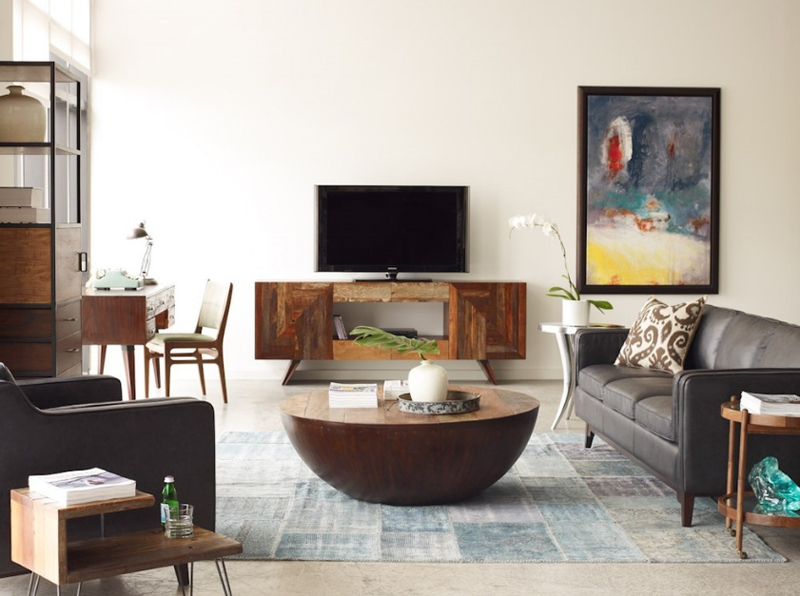 First on the list is one lovely wooden coffee table that centers the room. 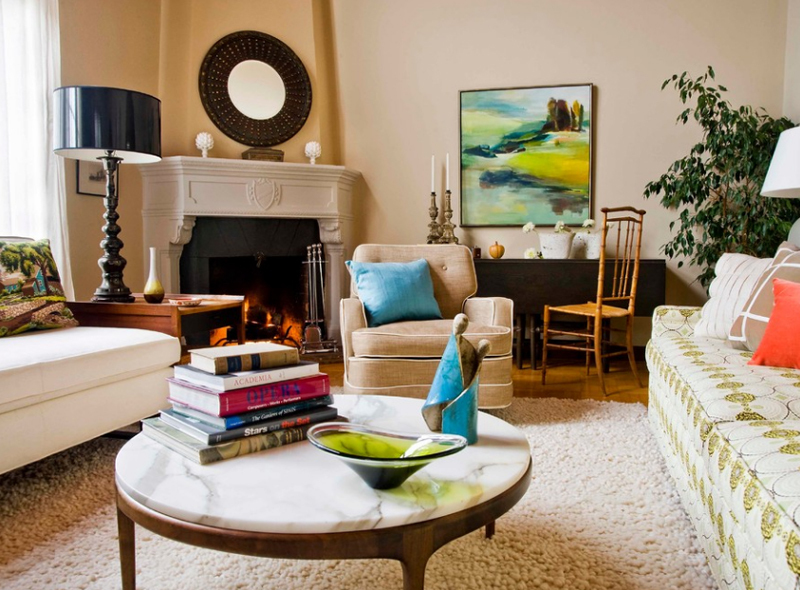 This living room sure is one charming space to be in because of all the colors seen in it. 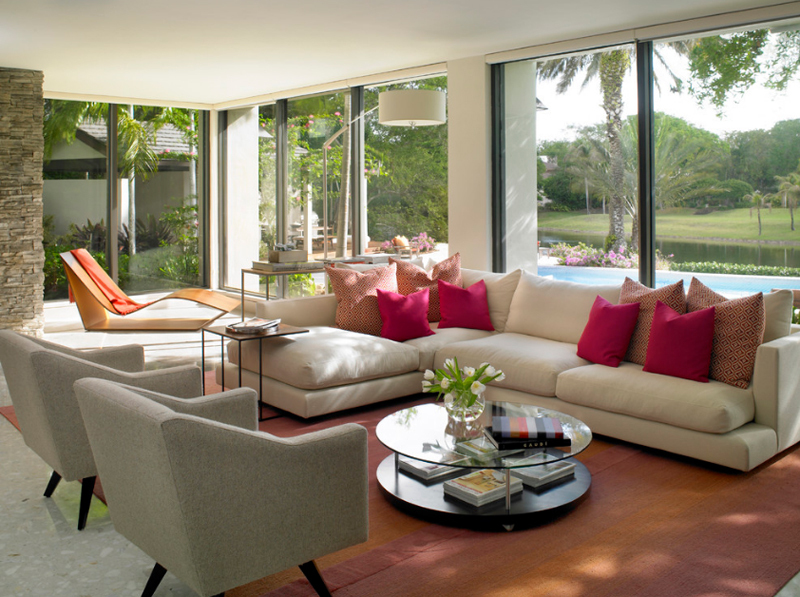 I love the velvety arm chairs and the colorful set of throw pillows seen on the couch and the seating by the window. 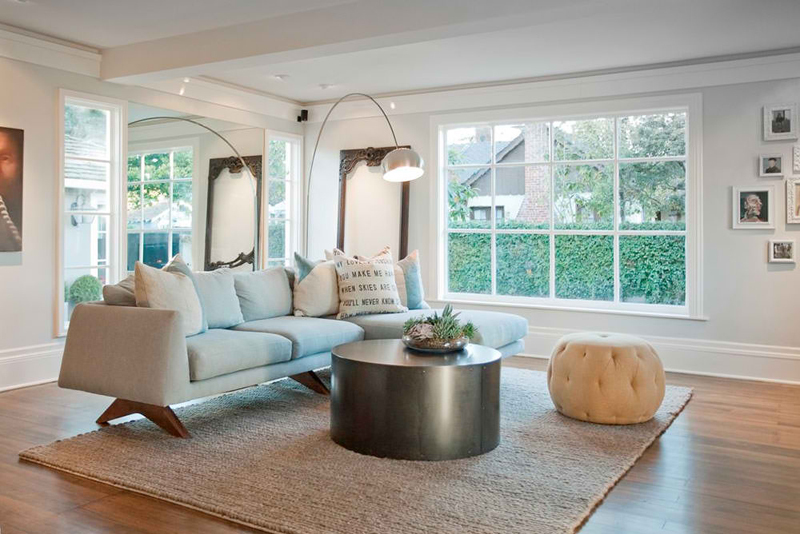 What do you think about the silver balls on the side of this living room? Pretty unique piece of decor, right? I would have to believe that decorations like this one is intended for staging purposes or for certain themed events; but more or less this space is just wonderful – with or without those silver balls. When I saw this living space, I thought that the wooden coffee table is just wonderful. It’s basically half of a sphere and it looks as wonderful as it is actually unique. Additional wooden furniture in this space makes it more interesting and rather Earthy. I totally love it! A living room that we have already featured on an old list and I think that this needs to be out there more because of how much this space is just fascinating. The colors seen in here is simple and really comfortable to the eyes and the wooden accents seen in here is just enough to make this space stand out. I would love to think that whatever the material this coffee table is made of, it’s pretty heavy. The flower design in the center of the table is catchy and with its shiny finish, this thing just looks far more interesting than it already is. I would even want to believe it has a bit of Asian flare to it. 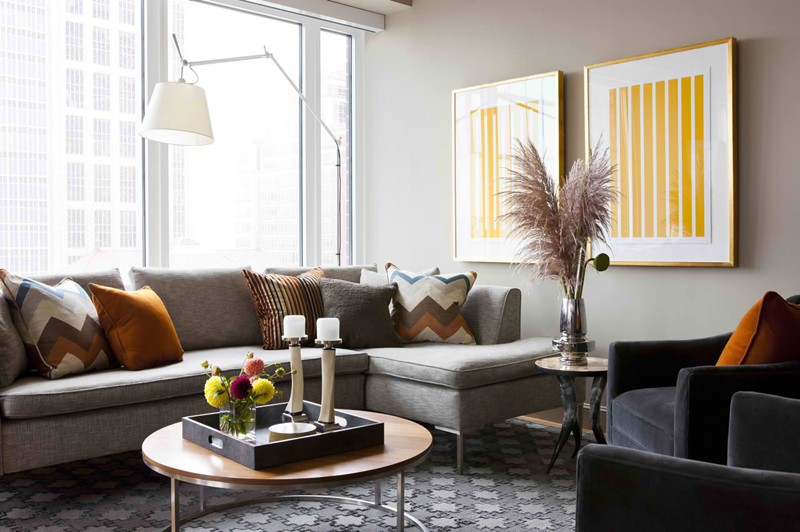 One colorful space that showcases how much you can actually play with colors and with this theme and concept of a playful condo. 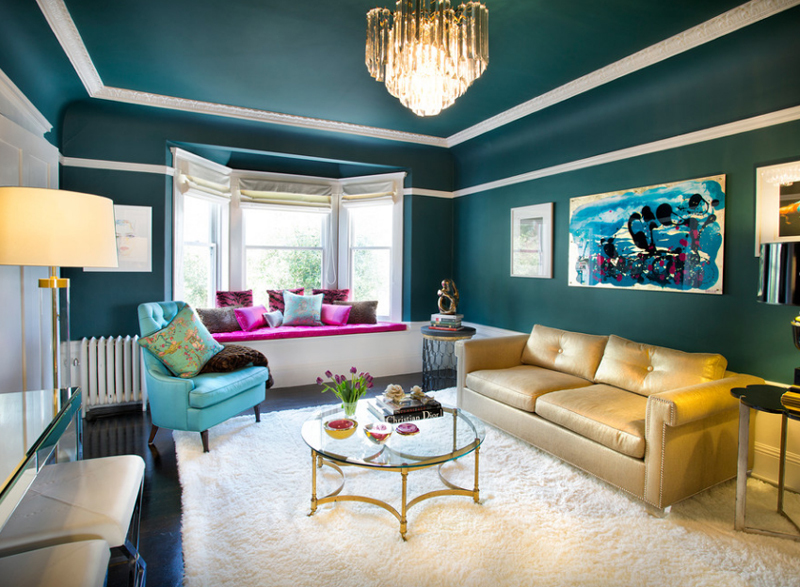 The use of an almost neutral shade of gold for the sofa allowed the designers to really add a turquoise arm chair and a carnation pink seating by the window. Whenever I see coffee tables like this one in this photo, I am reminded of how contemporary tables look nowadays. I mean, it’s pretty and really fashionable in a home design or decoration kind of way and I think that the color of the table and the sofa and the ottoman is just wonderful. Most tables or furniture made of glass or at least a portion of is usually go with anything it is paired with. 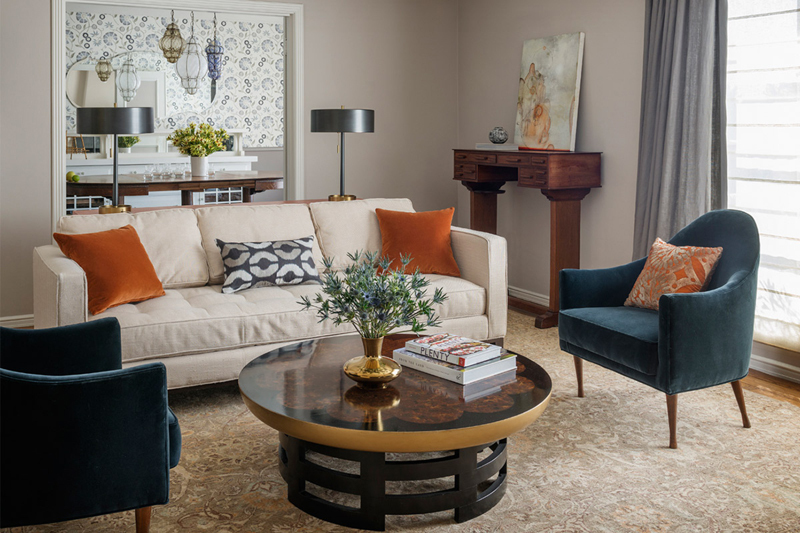 Most often than not, coffee tables are bought separately from living room furniture and sofas and sometimes it’s a trick for making them work but using a glass coffee table usually works just fine. 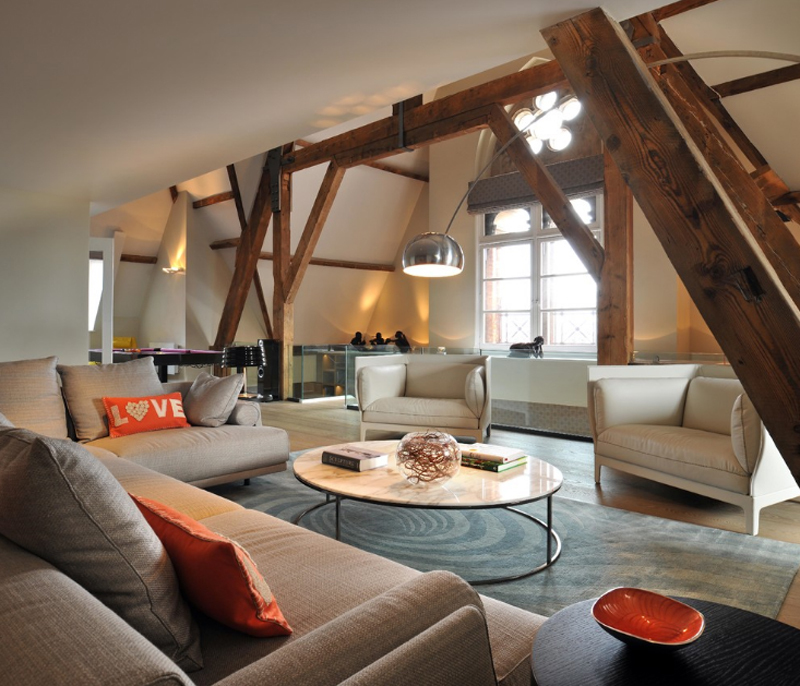 An industrial coffee table is seen in the center of the room; the wooden beams seen around the room is just as interesting as most lofts that I’ve seen. The large sofas and arm chairs in here makes it really comfortable and really wonderful to really hang out and have some friends over! 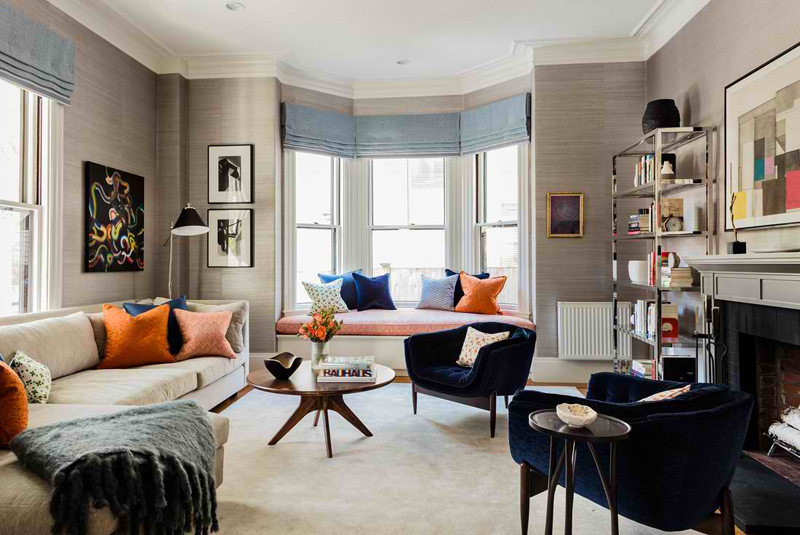 I fancy spaces like this one because even when they are smaller than most living rooms you can see in the internet or in magazines, you can see how much love and care was used to really achieve a stunning room like this one. The space has minimal decorations and it’s just enough – simple, beautiful and highly functional. The name of this living room is just beautiful. As an person who love social media, I came across a lot of sunset photos that people sometimes go gaga. 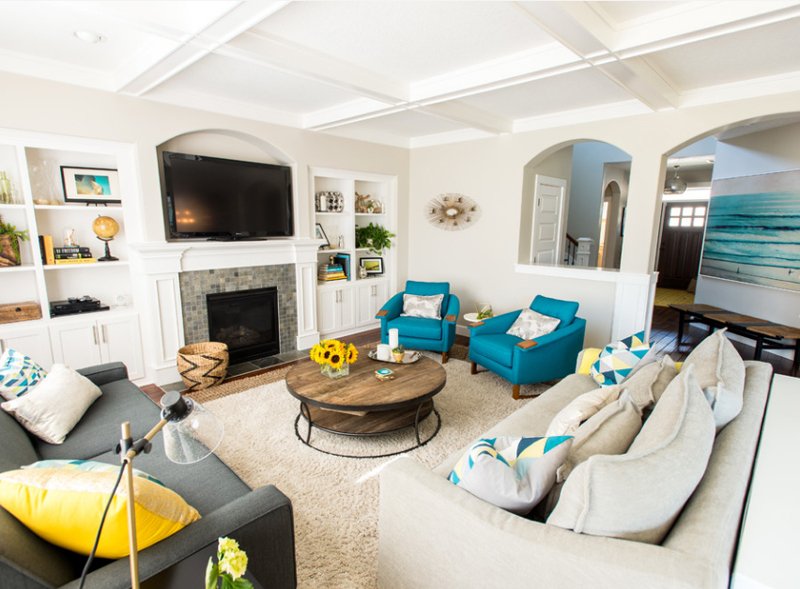 In here, we can see one living room with the right amount of furniture and decorations that can wow people who would be seeing it for the first time. I am fascinated with cabinets, shelves or walls that has tons of storage in them. There are tons of features that I came across that I totally loved and I think that the shelf on the left side of this living room is something I would consider having in my home. Also, I think that the coffee table in here is just as wonderful. The circular glass coffee table surely goes well with anything which makes it a really good investment. Even when you actually update your furniture or living room set in the future, glass coffee tables would still work for it. 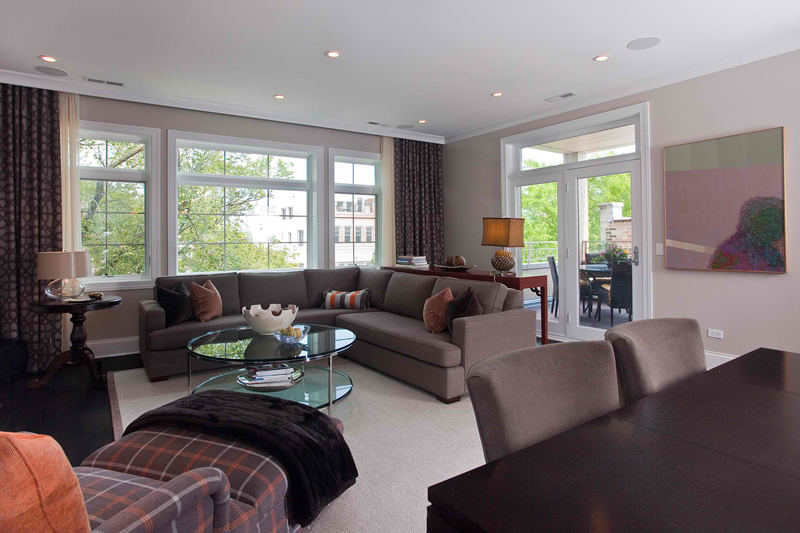 In this living room, we see how neutral the coffee table is against the sectional and the other furniture in here. 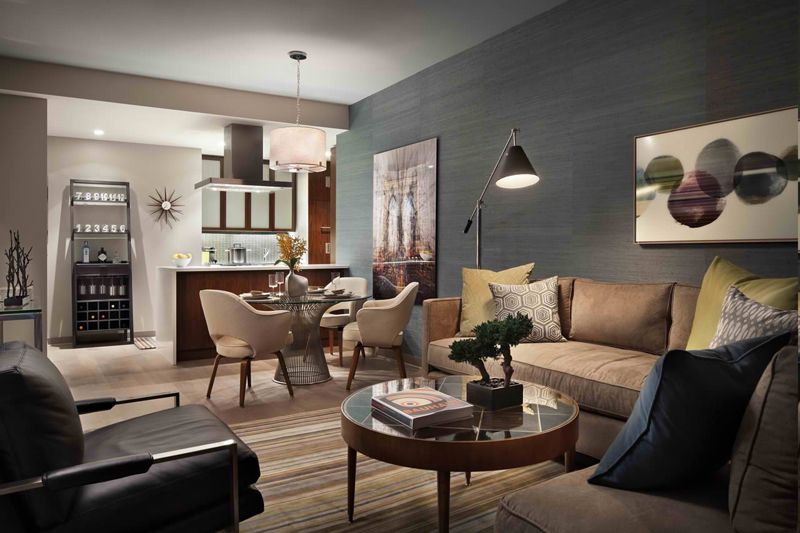 This cute living space has enough seating for at least a family of six. The sectional is wonderful for sure, but I’m pretty confused why they really have to wrap it with a couple of linens and fur. The coffee table is pretty vintage too, I like it. I know it must be premature, but I really love the blue arm chairs in this living room. It surely stands out aside from the colored pillow cases because everything around here is pretty neutral – whites, beiges and greys. I think that adding a wooden coffee table that unique made all the difference. This extended portion of the house sure looks pretty. I mean, this space is only ideal for homes that have less sunny days because believe it or not, this place (even how pretty) would definitely feel so humid during warm weather. What do you think about the unique coffee table in here? Pretty awesome, right? Pairing it with the white couch made it look really fancy. In this Delaware living room, we see one large coffee table made from dark wood which complements well with the furniture and decorations in here. 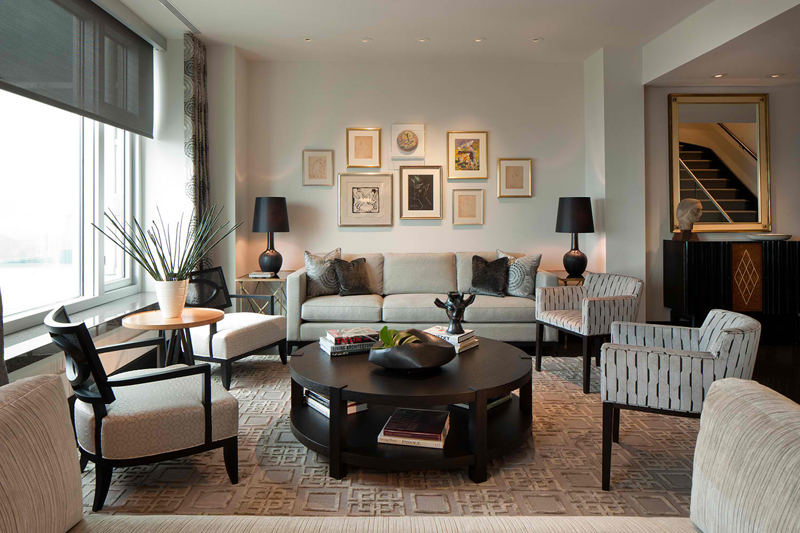 I actually fancy the two separate designs of the arm chairs on each sides of the round coffee table. There are a couple of things that I think are great in this living room – the color of the walls, the choice of sofa and throw pillows and the cute chairs paired with the dining table! I know I might not have mentioned the coffee table, but I think this space could have done better, but truth be told, I think it’s nice too. From this angle, I find this living room a bit eccentric. 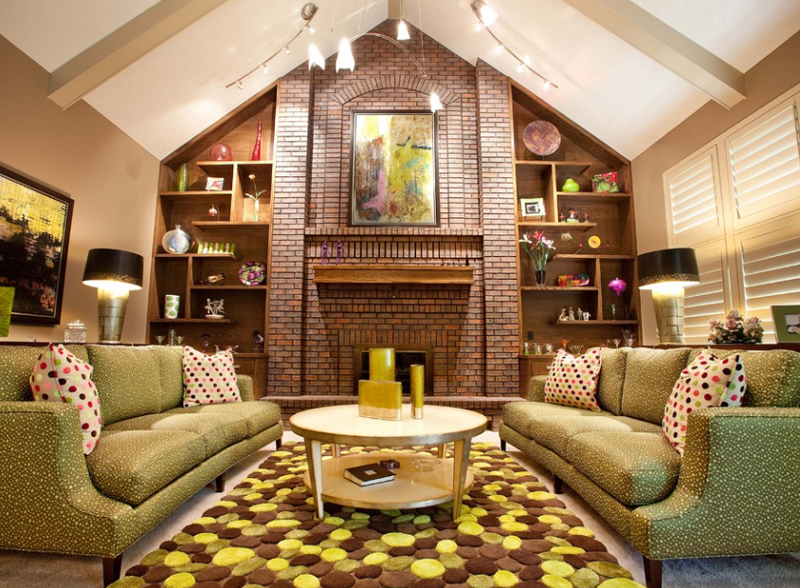 The color and print of the sofas is pretty unique, the colorful area carpet and the brick wall with the fireplace and mantle sure looks awesome. I don’t know what the main concept of this living room is, but I think that this is one beautiful space. Last on the list is from Terrat Elms. A cute modern living room with one of the best furniture there is. The sectional and the arm chairs looks neat, the coffee table is pretty cool too; but my favorite in this picture is actually the picture on the wall, I don’t really get it, but I like it. This list of 20 Unique Round Coffee Tables in the Living Room is something that you might have seen already and I think that as much as these living rooms already look stunning on their own, if you’re interested, you can check the list about Unique Designs of 15 Round Oak Coffee Tables for more inspiration in choosing a coffee table for your living room.